From time to time at Farrell’s we will be offering suggestions of some fun activities you can share. 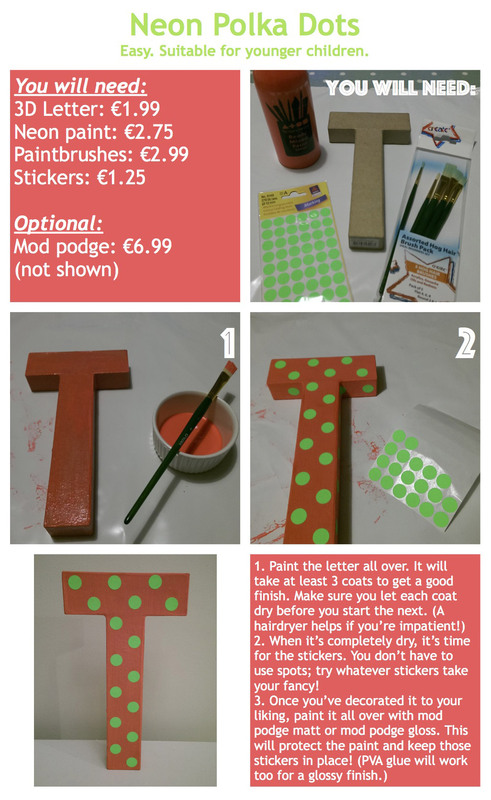 So, first up, here’s something creative to do during the summer holidays – decorating 3D letters! Paint the letter all over. It will take at least 3 coats to get a good finish. Make sure you let each coat dry before you start the next. A hairdryer helps if you’re impatient. When it’s completely dry, it’s time for the stickers. You don’t have to use spots—try whatever takes your fancy! Once you’ve decorated it to your liking, paint it all over with mod podge matt or mod podge gloss. This will protect the paint and keep those stickers in place. PVA glue will work too for a glossy finish. Paint the letter, front and back, with one colour. It will take 2 to 3 coats to get a good finish. Let each coat dry before you start the next. A hairdryer helps if you’re impatient. Paint the edges with the second colour. Mask off stripes on the front and paint the gaps in the second colour. Peel off masking tape while paint is still wet. Tidy up the edges with a cotton bud dipped in water. Leave to dry. Outline the stripes with a sharpie. Paint all over with mod podge matt or mod podge gloss. This will protect the paint and keep those stickers in place. PVA glue will work too for a glossy finish.